5.4) Constitution of Pakistan (1973). Art.212… Appeal of Service Tribunal or Supreme Court….effect…. 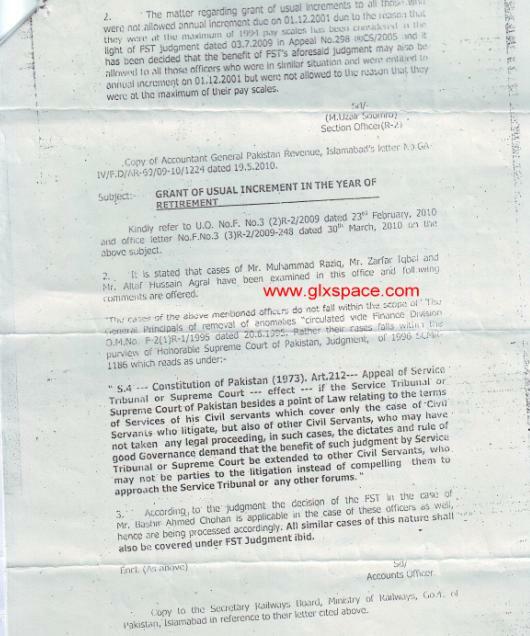 If the Service Tribunal or Supreme Court of Pakistan besides a point of law relating to the terms of service of his civil servants which cover only the case of Civil Servants who legitimate, but also of other Civil Servants who may not have taken any legal proceedings, in such cases, the dictates or rules of good governance demand that the benefit of such judgment by Service Tribunal or Supreme Court be extended to other Civil Servants who may not be parties to the litigation instead of compelling them to approach them to the Service Tribunal or any other forums. The above mentioned statement clearly shows that once any decision is made by Supreme Court or Service Tribunal in favour of any employee who files petition in the court, its decision will also be made applicable to the other employees of the same issue who don’t file a petition in the court. Is a judgment of Honorable Court is available, the facility once given to a government employee may not be taken back. If available please give the reference. Any reference of through proper channel if an employee intends to apply for same post e.g APS to APS in different deptt. My application was rejected by admin office stating that employee cannot apply for a post equel to same status but can apply for higher post. Plz share any reference/ rule position. Any lawyers who can deal promotional matters in government services especially in atomic energy related departments. anyone guide or refer any judgement of supreme court relating to the matter where the services of contract/probationers employees been regularized from date of appointment, and the benefit of above mention matter extended to the other similarly placed contract/probationer employees who will not the party in the petition. the supreme court but later on in review petition supreme court turn down the earlier decision. what will be the fate of equally placed employees whom the benefit is extended by the court. Any decision of supreme court/high court THAT PREMATURE INCREMENT BE GRANTED TO INITIAL RECRUITMENT (IF APPLIED THROUGH PROPER CHANNEL)SIMILAR TO PROMOTION. PUNJAB GOVT IS NOT ALLOWING IT. @ Mazhar Ilyas Nagi Adv. Thank You so much sir for such a detailed information on non-litigating parties. it is very helpful. I was in a dire need of this feed. Kindly send me judgement of court regarding regularization of a temporary/contract employee serving for last 5 years please. Dear Rao KK, I have not the copy of the same. Thanks Mir Wali Sahib u brief me a bit details regarding AGPR UO. 1. Respondent No. 1 Comments before Honorable Court that the Petition is Competent and Maintainable Under Article 199, Constitution of Islamic Republic of Pakistan. 1. The respondent No.1 admitted in the objection that the Petition is competent and maintainable under Article 199 of the constitution, whereas the respondent No.2 denied the maintainability of the petition which is incorrect. The petitioner filed writ petition against the impugned order dated 19-05-2010. NATPOW is an Autonomous body of Ministry of P&D Division, following, the merged/defunct NGOCC an Organization of defunct Ministry of MOPW Government of Pakistan in to NATPOW created in 21-11-1994 under the Charitable Endowment Act 1890. Role of NATPOW regulating Ministry of MOPW now Ministry of P&D Division. (ii) PART II) THE GAZETTE OF PAKISTAN, EXTRA. NOV. 21, 1994. 2177 Iii----“Three ex-officio Directors who unless otherwise designated by the Federal Government shall be Secretaries of the following Divisions who may be represented by their nominees not below the rank of the Joint Secretary”. Incorrect, that the Petitioner since long working on incumbent position of Admin & Personnel Officer, (A&PO) NATPOW, while the reality was different from his claim although the Petitioner since 11-06-2008 until dated 06-02-2009, hardly worked for eight (08) months that the former respondent no.2 issued through no.1 the Petitioner premature & force transfer on 06-02-2009 although apparently it was in public interest. So in spite of the cited above fact the Petitioner hence forth persuaded the office order of respondent no.1 to hand over the charge of A&PO without objection to admin assistant without waiting of his predecessor and the following day on 07-02-2009 reported to DS (Admin-1) defunct Ministry of MOPW. Incorrect the claim, out of three (03) established GDCBC Committees none had conducted inquiry as per NATPOW Scheme of Administration, although, the said issue raised after differences was developed among the respondent no.2 & Petitioner due to former (Copy Available) eight (08) illegal orders. Despite the status of Dr. Nasir Mohiuddin Program Officer (Tech.) NATPOW was found same of Petitioner status, who on the first day arrival of Petitioner at defunct Ministry of MOPW, directly served from NATPOW the first explanation on 07-02-2009 with same allegations with narrated Clauses of Chapter no.6 & no.7 of NATPOW Scheme Administration followed by a Charge Sheet on 18-03-2009 with same allegations & clauses. Hence the inquiry officers of Committee headed by Dr. Nasir Mohiuddin until dated 19-05-2010 no any such inquiry was conducted due to respondent no.2 unlawful pressure to write down the findings of inquiry as per his wishes against the Petitioner. In addition of above the status of Dr. Nasir Mohiuddin was incompetent while the incumbent position of Program Officer (Tech.) NATPOW only occupy at NATPOW by female Doctor, and the former respondent no.2 with the support of former Minister of PW was violated the rules while in haste brought Dr. Nasir Mohiuddin from MOPW on deputation from defunct MOPW to NATPOW incumbent position of Program Officer (Tech.) NATPOW was specifically for female Doctor at NATPOW. Apart from above, incorrect, the new claim of respondent no.2 as per his submitted comments before the Honorable Court that GDCBC Committee was reconstituted on 22-04-2009 under the Chairmanship of Dr. Shafiq Ur Rehman former Director P&D NATPOW with inquiry officers, Syed Sarfraz Hussain Shah Deputy Director of defunct MOPW and Dr. Nasir Program Officer (Tech.) NATPOW as closes friends of respondent no.2 of controversial status. According to Petitioner recent contact with Dr. Shafiq Ur Rehman was flatly refused the former respondent no.2 claim of reconstituted Chairman and conducting of inquiry against Petitioner. Although despite the previous on going government of PPPP had already been repealed the Ordinance of Employees Removal of Service. Likewise, the last Explanation issued on 02-10-2009 with same Clause of Chapter no.6 and no.7 of Scheme of Administration was served to Petitioner on 2-10-2009, through incredible official Mr. Sohail Farouqi despite his status are manifold less then of Petitioner. Hence the last Explanation hearing under the Chairmanship of former DS (Admin-1) defunct Ministry of MOPW was also ended on 23-11-2009 without conclusive result due to lack of proper inquiry need’s to conduct as per NATPOW Scheme of Administration. In this regard on 23-11-2009 the hearing participants were told by former DS (Admin-1) defunct Ministry of MOPW that his office would soon made contact with NATPOW to conduct proper inquiry in this issue as per NATPOW Scheme of Administration prescribed Employees Service Rules 1997 but all in vain. Despite petitioner several re presentations from time to time before respondent no.1 and no. 3 while not alone since 23-11-2009 but since 07-02-2009 no any such proper inquiry as per cited above prescribed rules was conducted against former respondent no.2 Petitioner.. Hence in case if any reconstituted GDBC Committee was existed on 23-11-2009 then instead of former DS (Admin-1) why the hearing of last Explanation dated 02-10-2009 was avoided under the Chairmanship of Dr. Shafiq former Director P&D NATPOW now Registrar Quaid i Azam University Islamabad. Same also in case if the Petitioner was found guilty of misconduct then since 23-11-2009 until dated 19-05-2010 the respondent no.2 why did not inform in personal capacity or through Petitioner immediate boss former DG (M&S) Ministry of Population Welfare, MOPW now Ministry of P&D Division. Therefore since 23-11-2009 hearing of last Explanations is principally & lawfully as well as now respondent no.2 new claim of reconstituted GDBC Committee dated 22-04-2009 before the honorable Court of IHC Islamabad the status of served explanations and Charge Sheet through Dr. Nasir PO (Tech.) NATPOW GDCBC Committee were invalid including Clauses Chapter no.6 & no.7 of Scheme of Administration with allegations to treat him unethically & unprofessionally and was not cooperated in Ch. Mohd Farooq cases, were unmatched with his new claim of allegations of malicious campaign against NATPOW and next step promotion. Despite respondent no.2, reconstituted the first established GDBC Committee on 03-02-2009 under the Chairmanship of Dr. Shafiq Ur Rehman but could not serve any explanation or Charge Sheet to Petitioner nor conducted any inquiry as per Scheme of Administration prescribed Employee Service Rulers 1997 except the Board was exercised their discretion power as per inapplicable Clause no.13 (1) Chapter no.3 Scheme of Administration the Petitioner was terminated without found guilty of misconduct through any proper inquiry. Incorrect claim because he neither proves his earlier claimed allegations nor his new claim of allegations through any inquiry as per Scheme of Administration. However, about new allegations he did not serve any such Charge Sheet or Explanation to Petitioner. Therefore, in view of cited above fact, the status of reconstituted Committee were also no more valid following on 02-10-2009 served Explanation with same Clauses and its hearing was ended without conclusive result on 23-11-2009. Besides at the time of by unlawful decision the Board-HR&P Committee was by passed section no.27 Scheme of Administration followed by his own installed Board exercised their discretion power as per inapplicable clause No. 13 (1) and Board was ignored the (Copy Available) Clause No 13(2) Chapter No.3 NATPOW Scheme of Administration despite of fact at that time no any such file was moved at defunct Ministry of MOPW in regard conducting any proper inquiry or termination because since 07-02-2009 until dated 19-05-2010 the Petitioner working with former DG (M&S) Ministry of MOPW. Although, since 06-02-20009 after Petitioner transfer the respondent no. 2 no more remained the Petitioner immediate boss except former DG (M&S) defunct Ministry of MOPW and if at that time any allegations was pending against the Petitioner then instead of transfer to defunct Ministry of MOPW it was pre requisite as per NATPOW Scheme of Administration to conduct proper inquiry, even after transfer he did not call the Petitioner from defunct MOPW to face the allegations at NATPOW. Decision: “Board unanimously agreed/endorsed as under: - In the largest interest of the organization, since Mr. Liaqat Ali Khan has affected the reputation/credibility through malicious campaign, he has left no space for himself to work in the Organization. Mr. Liaqat Ali Khan, be terminated as per Employees Service Rules, 1997”. At defunct Ministry of MOPW a “Special Assignment Task” was assigned as per approved order of Respondent No.1 (Annexed- ) vide reference Letter NO.5-15/2007-NGOs-NATPOW-VoI-II dated 4th’ May 2009, was highly appreciated by the higher authority as well as the Petitioner immediate boss DG (PPSO) and Mr. Sarfraz Hussain Shah Deputy Director of defunct Ministry of MOPW. At NATPOW the “Petitioner Performance & Evaluation Report” vide letter no. F. No. 4(24) 2002-Ad (P) on 09-07-2009 submitted before immediate boss Dr. Shafiq Ur Rehman former Director P&D NATPOW through secretary P&D (Copy Available) with ref.2/Misc/2008-09 dated 15-07-2009, was highly appreciated and positively recommended before respondent no.2 after properly judge with the remarks to return the Petitioner NATPOW back as soon as possible to contribute own organization. In addition during the stay at defunct Ministry of MOPW since 07-02-2009 until dated 19-05-2009 the Petitioner immediate boss former DG (M&S) defunct Ministry of MOPW did not send any negative remarks to respondent no.1 as honorable Secretary of defunct Ministry of MOPW against the Petitioner during the working under his supervision. Incorrect, the claim of respondent no.2 that the Petitioner was terminated as per NATPOW Scheme of Administration prescribed Employees Service Rules 1997, was by passed in spite of respondent no.2 rival as well as controversial status in this issue was created among both due to his illegal orders denial by Petitioner. Consequently the former respondent no.2 due to fear of expose in any inquiry as per Scheme of Administration prescribed Employees service Rules 1997 was at last directly sent the said issue to his own mind installed Directors Board-HR&P Committee followed by Board through exercised their discretion power as per inapplicable Clause no.13(1) Chapter no.3 Scheme of Administration for further action without providing prior hearing (Copy Available) as well as without conducting proper inquiry through GDCBC Committee neutral officers from NATPOW & defunct Ministry of MOPW. Secondly as per Section No. 27 Scheme of Administration the HR&P Committee only enjoy the authority that after investigation in any issue to give suggestion to Board for conducting proper inquiry as per Scheme of Administration through honest & neutral Inquiry Officers and same also give suggestion of hire any Legal Advisor for resolving any issue. Secondly the issue was raised at that time Board headed by Dr. A Mushtaq Khan was well aware about the issue among the respondent no.2 and Petitioner was created due to former illegal orders were denied by Petitioner as Admin & Personnel Officer of NATPOW to avoid future administrative & financial irregularities at NATPOW. But all in vain since 18-12-2008 the date of respondent no.2 entrance at NATPOW as CEO through back door with the support of former Minister without advertisement teats & interview without endorsement of MP-II status and without recommendations and consultation of former respondent no.2 as secretary defunct MOPW and former respondent no.3 of Board headed by Dr. Mushtaq A khan at that time at NATPOW. In view of cited above fact to avoid his expose the former respondent no.2 with the support of former Minister of PW the Board headed by Dr. Mushtaq A. Khan was terminated before completion of three(03) tenor while installed new Board at that time headed by Begum Suyria Amiruddin as a Senator upper hours of PPPP. Hence the former respondent no.2 despite eight (08) months duration did not able to put up this issue before the Board headed by Dr. Mushtaq A Khan for further direct one sided action against that Petitioner because the Board at time aware of his illegal orders for which he tortured the Petitioner badly and back door entrance at NATPOW without MP-II endorsement. Despite of his owns mind Directors installed Board the Petitioner hence fourth brought the problems faced to petitioner at defunct Ministry of MOPW after transfer in public interest in the notice through submitted re presentation dated 20-08-2009. But all in vain and his new installed Board paid the role of partiality and did not call the Petitioner from defunct Ministry of MOPW to NATPOW to face any allegations or consequences of submitted re presentation to his installed Board since 20-08-2009 the date of re presentation to new installed Board of his own mind until dated 19-05-2010 the date of unlawful termination. Therefore, the Petitioner on 19-05-2010 issued termination office order is null & void because on cited above date the status (Copy Available) of respondent no.2 was found incompetent because he did not able to get endorsement of his status as MP-II until ended his two year’s contract on 31-12-2010 except in first month of Jan. 2011 got extension of one year contract was also ended on 31-12-2011. According to Confirmation of the Minutes of 45th Meeting that the BoD confirmed Minutes of the 45th Meeting of the Board of Directors held on 19-12-2009. (Copy Available) In this regard until 45th’ Board Meeting all the Board Meetings were held at the time Board headed by Dr. Mushtaq A Khan except the minutes of his new installed Board meeting held on 14-05-2010 were found silent about the poor performance of Petitioner, or malicious campaign and next step promotion. According to Confirmation of the Minutes of 45th Meeting that Termination as per NATPOW Employees Service Rules, 1997 after recovery of amount: The claim was proved now after endorse by Board because respondent no.2 was timely informed by Petitioner that apart from “Official Vehicle Theft Case” Ch. Mohd Farooq (Copy Available) was found guilty and involved several other cases of NATPOW required his action. He was also told that Ch. Mohd Farooq is habitual of such practice and he would soon goes for another embezzled case at NATPOW resulted at last he again embezzled one (01) million from NATPOW account of government grants. Hence another side due to former Minister of PW after passage of one (01) month wrote again another letter to former DG (PPSO) defunct Ministry MOPW with the request for conducting another fresh inquiry for the purpose to provide another relief to Ch. Mohd Farooq while as compare to him, the Petitioner was treated discriminately to avoid relief and his Council in last trial told the honorable Court that NATPOW is a “Trust” to work without involvement of regulating Ministry of P&D Division Government of Pakistan. Therefore in view of cited above circumstance the Petitioner at last compelled to send re presentation on 20-08-2009 to his owns installed Board in connection of problems faced at defunct Ministry of MOPW especially adjustment on any vacant position as well as did not send to NATPOW back nor until now conducted any inquiry. (Copy of Re Presentation Available). In return, instead of problems solving after passage of eight (08) months on 19-05-2010 issued the termination letter through directly one side action of his installed Board exercised their discretion power as per inapplicable Clause no. 13 (1) Chapter no.3 NATPOW Scheme of Administration without Show Cause notice of malicious campaign & next step promotion and also as per Explanation dated 07-02-2009 and Charge Sheet dated 18-03-2009 was served to petitioner through Dr. Nasir headed GDCBC Committee was established on 07-02-2009 he did not prove first the allegations to treat him unethically & unprofessionally and did not cooperate in Ch. Mohd Farooq case nor providing any prior hearing to record the Petitioner point including NATPOW staff those were present at the time of weekly meeting the termination letter was delivered to Petitioner on 26-05-2010 late hours in the way to home instead of through Petitioner immediate boss former DG (M&S) Ministry of MOPW now P&D. 3. Incorrect please view serial no.2 of Preliminary Objection. “That the Petition is mela fide”. It’s also the mala fide act of the Petitioner that the respondent no. 2 annoyed the approval of fuel expenditure for the month of Jan. 2009 (Copy Available) when the Petitioner as A&PO to place before the former respondent no.2 the fuel file in a first week of Feb. 2009 for his approval but instead of approval he was created hatred against the Petitioner and in return the said issue was raised among both. Although after fact finding inquiry which was conducted at Ministry of MOPW level by the approval of former respondent no.1 the former respondent no.2 returned to NATPOW the fuel expenditures for the month of Jan.2009 while the fuel expenditures from Feb. 2009 until dated 31.Dec. 2011 was still due against former respondent no.2. Despite the claim was proved through Fact Finding Inquiry at MOPW level conducted on 24-10-2009 by former DG (Tech.) defunct MOPW with the approved order of respondent no.1 and the fuels expenditure of NATPOW Official Vehicle in unlawful usage of former Minister of PW was returned to NATPOW by respondent no.2 for which the Petitioner was badly tortured. To avoid their expose the said Inquiry was partially conducted due to fear of former Minister of PW and latter on as per her instructions it was filed after i.e. dated 24-10-2009 in the office of former DG (PPS) MOPW without any conclusive result findings or action against respondent no.2 or Petitioner. Hence it was amazing that since 07-02-2009, “kept for one & half year on unlawful harassment without adjustment on any vacant position at MOPW nor send to NATPOW on his original position nor conducted any proper inquiry at last on 19-05-2010 the Petitioner was terminated of NATPOW 18 years unbreakable & unblemished service with service contract for indefinite period of NATPOW autonomous apex body of regulating Ministry of Planning &Development Division. Same earlier due to respondent no.2 frequent harassment communication was made with the official of Ministry of MOPW, about Directors repatriation to parent departments resultantly the Petitioner was warned through served (Copy Available) Explanation by respondent no.1 as former secretary of defunct MOPW through Syed Sarfraz Hussain Shah Deputy Director defunct MOPW resultantly the Petitioner further avoided his illegal orders. It was also mala fide act of the Petitioner that on 25-03-2009 during the meeting brought in the notice of former Minister of PW the problems faced to petitioner at defunct Ministry of MOPW due to respondent no.2 while return instead of address the problems an Office Order of “OSD” was served on 31-03-2009 while again transferred from the office of former DG (PPSO) to DG (M&S) defunct Ministry of MOPW. 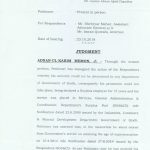 Ambiguity was found while one side he claimed as per his submitted comments & termination letter that the Petitioner was terminated through his installed Board exercised their discretion power under the directly inapplicable Clause No.13 (1) Chapter no.3 Scheme of Administration while another side the former respondent no.2 was also claimed that the action was taken as per NATPOW Scheme of Administration prescribed Employees service Rules 1997 (Copy Available ) through reconstituted GDBC Committee inquiry headed by Dr. Shafiq Ur Rehman former Director P&D NATPOW was in correct. Therefore, it was beyond comprehension he took direct & one sided action through Board was exercised their discretion power directly as per inapplicable Clause 13(1) Chapter no.3 and same time he was also claim of conducting inquiry through GDCBC Committee was incorrect. His installed Board took directly one sided action through Six (06) Directors instead of (Copy Available) required Seven (07) Directors as per Scheme of Administration while out of Six (06) four (04) were found of controversial status i.e. respondent no.2 himself, Chairperson Board, Dr. Parveen Ashraf Director Board and former DG (PPSO) defunct Ministry of MOPW. Incorrect, his claim as per termination letter that his installed Board in its Meeting held on 14-05-2010 observed serious concern about the allegations against Petitioner although despite of fact it were his owns eight (08) illegal orders (Copy Available) who considered it his insult following denied by Petitioner as Admin & PO of NATPOW while in return same he also created hatred and personal grudges against the Petitioner resultantly on first series of torture the Petitioner was transferred to defunct MOPW despite apparently it as in public interest. Therefore it was the Petitioner voice against his unlawful tortured that the Petitioner was continuously kept in harassment at defunct Ministry of MOPW since 07-02-2009 until dated 19-05-2010 to avoid the Petitioner adjustment on any vacant position at defunct Ministry of MOPW due to his affiliation with former Minister of PW mostly their illegal orders were belong to former Minister of PW. Hence respondent no.2 claim of Petitioner resistance was also incorrect while it was nothing except aimed to providing cover to his late action, was taken after passage of long duration of one (01) & half year on 19-05-2010 although during at the time of previous Board headed by Dr. Mushtaq A Khan the former respondent no.2 did not able to place the said issue before at that time Board for further action due to fear of his expose. 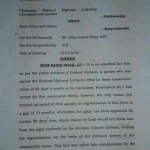 According to his comments & termination letter that the Petitioner was terminated through Board was exercised their discretion power as per inapplicable Clause no.13 (1) was unlawful as per NATPOW Scheme of Administration because he claimed that the action was taken as per NATPOW Scheme of Administration prescribed Employees Service Rules 1997. Despite since 07-02-2009 until dated 19-05-2010 no any such proper inquiry was conducted at NATPOW or defunct Ministry of MOPW through neutral inquiry officers except his installed Board direct one sided action after exercises their discretion power Six through owns mind (06) Directors as per in applicable Clause no. 13 (1) Chapter no.3 Scheme of Administration. Therefore since 07-02-2009 until dated 19-05-2010 the inquiry could not conducted due to the Inquiry Officers of GDCBC Committee headed by Dr. Nasir denied respondent no.2 illegal order to write down the findings reports of inquiry as per his wishes. According to another reason behind the late action taken against the Petitioner was the respondent no.2 waiting for his owns mind Directors Board installation with the support of former Minister of PW, despite the said issue was raised at the time of previous Board due to respondent no.2 (Copy Available) illegal orders while the previous Board had already aware of real fact had already been expressed concerns due to his back door status without MP-II endorsement, resultantly the previous Board was terminated before completion of three (03) year’s tenor. Hence since 18-12-2008 until dated August 2009 during the tenor of eight (08) months duration of previous Board of Directors (BOD) the respondent no.2 did not able to send the said issue to previous Board for further action or even goes for proper inquiry through any his claimed established GDCBC Committee either under the Chairmanship of Dr. Shafiq Ur Rehman former Director P&D NATPOW and Dr. Nasir Mohiuddin program officer (Tech.) NATPOW since 18-12-2008 until dated August 2009. His claim of reconstituted Committee dated 22-04-2009 under the Chairmanship of former Director P&D NATPOW Dr. Shafiq Ur Rehman was also incorrect because in this regard the claim of former respondent no.2 was refused by him while he told that at NATPOW he did not conducted any inquiry against the Petitioner. Apart from cited above the status of inquiry officers of reconstituted Committee was also found controversial due to affiliation with former Minister of PW and former respond dent no.2 besides the status of program officer (Tech.) 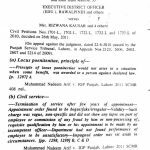 NATPOW Dr. Nasir was found same of Petitioner status NATPOW pay Scale P-3 equivalent to government BPS Pay Scale Grad-19. At NATPOW the incumbent position of program Officer (Tech.) specifically for female Doctor (Copy Available) hence the former respondent due to former Minister Affiliation to hides their administrative & financial irregularities at NATPOW had already been proved (Copy of illegal orders available) in haste brought Dr. Nasir Mohiuddin from defunct MOPW to NATPOW on incumbent position of female Doctor as Program officer (Tech.) at NATPOW. In addition of above the status of Syed Sarfraz Hussain Shah former Deputy Director of claimed false reconstituted Committee was also controversial due to former Minister of PW affiliation due to his brother Mr. Riaz Hussain PS to former Minister of PW. 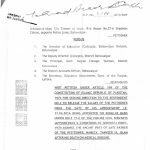 Secondly the status of Syed Sarfraz Hussain as a Deputy Director Grad-18 was found less then of Petitioner status of NATPOW Pay Scale P-3 equivalent to BPS Government Grad-19. Incorrect and whatever the Petitioner through his Council was submitted before the Honorable Court on the basis of real facts while did not conceal the material facts hence, the claim was incorrect that the Petitioner is guilty of misrepresentation and distortion of facts for malicious gain. National Trust for Population Welfare, (NATPOW) was established on 21st’ Nov. 1994 as an autonomous body by Government of Pakistan through its regulating defunct Ministry of MOPW following merged NGOCC in NATPOW with the status of autonomous body now regulating Ministry of P&D Division to supplement the government efforts to implement country population policy through NGOs etc. The Government through regulating Ministry of P&D Division now has complete control on NATPOW resources and initially invested 104 million while their interest raised on monthly basis to only cater the administrative expenditure of the organization while for their other activity like program related as per objective to providing Basic health facilities-reproductive health, Mother Child health care and FP and to meet the expenses of program activity through regulating Ministry allocating financial assistance as per PSDP (Copy Available) after approval of PC-1 of NATPOW. Even the Government of Pakistan through regulating Ministry of P&D Division has complete control over its financial resources at the time of its distribution among the beneficiaries NGOs affiliated with NATPOW through regulating Ministry of P&D Division while respondent no.1 as Principal Accounts Officer of NATPOW and member from Finance Ministry. 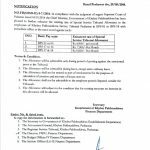 Chairperson Board and CEO were appointed with the approval of Federal Government through relevant Secretary of NATPOW regulating Ministry P&D Division for three (03) year’s tenor. Therefore, as per to Scheme of Administration the Federal Government had established NATPOW through its regulating defunct Ministry of MOPW now Ministry of P&D Division to attract donors to get funding from donors for on going activity through Economic Division and Ministry of Finance to further distributed on active NGO’s etc working in the filed of Basic Health- RHs, MCH & FP to supplement the Government efforts to implement population policy with the support of NGOs. (Copy Available) NATPOW invested 104 million and its’ interest with PC-1 allocation was supervised by BOD, the Secretary of regulating Ministry of P&D as a Principal Accounts Officer of NATPOW and Financial Advisor of Ministry of Finance as member BOD. NATPOW hair its employees with the approval of Federal Government relevant under the (Copy Available) Clause No. 13 (2) NATPOW Scheme of Administration then definitely terminated with the approval of Federal Government. Incorrect the claim because the Petitioner filed his Writ Petition under Article 199 “The Constitution of Pakistan” through Counsel submitted before the Honorable Court as narrated an employee of autonomous body of regulating Ministry of MOPW now Ministry of P&D Division other wise go to “FST” in case of claimed of Civil services. Petitioner has not suppressed the fact while on 20-12-1992 was appointed (Copy of To whom it may concern Available) on contract basis at NGOCC an organization of defunct Ministry of MOPW of Government of Pakistan funded with consolidated salary as Field Officer Grad-II Officer equivalent to Govt. BPS-18 as per 35th Board. Followed by in 21-11-1994 the NGOCC merged in to NATPOW on 16-01-1998 consequently without breaking of service further the Petitioner being as liability of defunct NGOCC an organization of defunct MOPW to get another contract for indefinite period effective from 01-01-1998 as Field Officer of NATPOW P-4 equivalent to Govt. BPS-18. 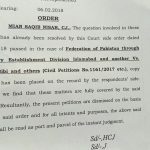 Therefore, the Petitioner through his Counsel prayed before the Honorable Court to direct the Council of respondent no.2 that along with Petitioner reinstatement with all consequential benefits followed by declared as regular employee in the light of the on going government policy of PPPP in regard regularizations of Contract employees of autonomous bodies/organizations of Federal Government and also the service rendered since 20-12-1992 to 21-11-1994 as employee (Copy Available) of NGOCC followed by NATPOW since 21-11-1994 to 12-12-1997 (Copy Available) would also adds with the total service petitioner rendered from 01-01-1998 until to date. The Petitioner in his field Petition through his Council did not conceal the material facts from the Honorable Court and is not guilty of misrepresentation and distortion of facts for malicious gain was nothing except to divert the kind attention of the Honorable Court from the factual fact. On 20th’ Dec. 1992 the Petitioner was appointed on contract basis as a Field Officer of GOP funded (Government of Pakistan) equivalent to Govt. BPS-18 at defunct NGOCC an organization of defunct Ministry of Population Welfare, (MOPW) Government of Pakistan. While considering agenda # 9 regarding review of Salary scales of the NATPOW employees in the meeting held on November 26th’ 2001, the attention of the Board of Directors was drawn to clause no. 5.09 of NATPOW Employees Service Rules, 1997. As per Para No. 8. “The Committee was informed that the government pay scales were made applicable in NATPOW when it was established in 1994. It was observed that taking in to account the revised salary scales of the government employees along with the facility of house hiring/rent, the proposed 25 % raise in salary scales of NATPOW employees would barely bring the both at par considering NATPOW Officers Grade- I, and Grade-II and grade-III as equal to government scale 19, scale-18 and sacle-17 respectively”. Therefore, whatever the Petitioner through his Counsel narrated in filed Petition, being as a liability of defunct NGOCC an organization of defunct Ministry of MOPW now NATPOW as an autonomous apex body of regulating Ministry of Planning & Development Division. Islamabad, the 21st’ November, 1994. S.R.O. WHEREAS the Secretary to the Government of Pakistan, Ministry of Population Welfare, Islamabad has applied for the vesting in the Treasurer of Charitable Endowments for Pakistan of the amount of one hundred million of rupees and the donations which may subsequently be received, to be applied in trust for charitable purposes known as the “National trust for population welfare” (NATPOW), the object of which extend to the whole of Pakistan. S.R.O. WHEREAS, the Secretary to the Government of Pakistan, Ministry of Population, has applied for the settlements, by the Federal Government, of a Scheme for the administration of the amount of one hundred million rupees and donations that may be received subsequently which is to be applied to trust for charitable purposes to be known as the “National Trust for Population Welfare” and which is to be vested in the Treasurer of Charitable Endowments for Pakistan. Sd/- (MUHAMMAD ASHRAF) RESEARCH OFFICER. c)	Planning and Development Division. The Board shall, from amongst, its members, also elect one member to be the Vice-Chairperson of the Board, who shall hold office for a term of three years. A Vice-Chairperson shall not be eligible for re-election to a consecutive second term. In the absence of the Chairperson, Vice-Chairperson shall conduct the affairs of NATPOW on his behalf which shall have to be reported to the Board and the Federal Government”; and The Board shall, from among its non-official members, elect a member to be honorary treasurer of the Trust. An honorary treasurer shall not be eligible for re-election to a second consecutive term. A Director, other than an ex-officio Director, shall hold office for a term of three years, and shall be eligible for re-appointment for subsequent similar terms. Subject: POSTING OF MR. NAWAZISH ALI KHAN ASIM, PROGRAM OFFICER (AN OFFICER OF EQUILVALANT (BS-19), NATPOW IN THE CDA ON DEPUTATION BASES. Mr. Nawazish Ali Khan Asim has been associated with National Trust for Population Welfare (NATPOW) since April 1999 as Programme Officer in Government pay scale equivalent to BPS-19. Hence if the Petitioner colleague Mr. Nawazish Ali Khan Asim who had availed already been availed the said opportunity as per 35th, NATPOW Board to work at Capital Development Authority (CDA) Islamabad first and then now on regular basis with Interior Ministry while the Petitioner being as a liability of defunct NGOCC an Organization of defunct MOPW now Ministry of P&D Division Government of Pakistan was avoided to adjust on any vacant position at defunct Ministry of MOPW but kept for one & half year as a “OSD” despite of facts the Petitioner was transferred to defunct MOPW on that basis of “in public interest” . Same it was great injustice and discrimination with Petitioner that despite of fact the Petitioner lawfully following fulfilled criteria got his next step promotion though as compare the Petitioner the former Respondent No.,2 and No.3 as well NATPOW present management was found silent in regard NATPOW those staff unlawfully entered at NATPOW as well as got their promotion through affiliation with ruling party e.g. former Respondent No .2 Mr. Iftikhar Durrani due to their eight illegal orders the said issue was raised. In this regard the Petitioner never suppressed the fact, while the National Trust for Population Welfare, (NATPOW) was established on 21-11- 1994 as an autonomous body by government of Pakistan following merged NGOCC an organization of defunct MOPW in to NATPOW under the regulating Ministry of MOPW now Ministry of P&D Division. 1. National Research Institute of Fertility Care (NRIFC) Karachi. 2. Central Ware House & Supply Karachi. 3. National Institute for Population Studies (NIPS) Islamabad. 4. National Trust For Population Welfare, (NATPOW) Islamabad. Further as per the following Chapter 14 NATPOW Employees Service Rules 1997 Clause/ Section No. 14.12: Section 14.12: “NATPOW shall comply with all and/or any statutory requirements applicable to NATPOW, such as contribution to Employees Old Age Benefit Institutions, Social Security, Income Tax Ordinance, l979, etc. or any other statutory requirements and laws, and modification and enactment of such laws”. National Trust for Population Welfare (NATPOW) was established in 1994 as an autonomous body following merged defunct NGOCC an organization of defunct Ministry of Population Welfare (MOPW) Government of Pakistan with the investment of 104 million endowment fund. The main aim & objective is to working in the realm of reproductive health and Mother Child Health care etc with the partners affiliated NGOs to improve the health of poor women & children based in semi urban and remote rural areas of Pakistan. NATPOW has own by laws and rules regulations which was formulated & implemented since 1997. As per last year one of the NATPOW BOD meetings minutes the former Secretary of defunct was refrain NATPOW for taking decision of amendments in their own capacity. Further as per minuets NATPOW was told that Ministry of Population Welfare (MOPW) is providing facilitation to NATPOW and providing funds out of its PSDP annual allocations. It is important to mentions that Secretary, MOPW is the Principal Accountant Officer, for the funds provided to NATPOW out of tax payers’ money and, therefore, the proposed amendments cannot be concurred/agreed as the powers of the Federal Government cannot be parted and left to the BOD. The Government has full stakes in the over all administration and provision of funds and also provides an umbrella protection to NATPOW. MOPW is also doing advocacy with donors to provide funds/grants to NATPOW. As the MOPW is providing facilitation to make NATPOW a vibrant organization which is evident from the budgetary allocation during 2009-2010, therefore, there is no need of such amendments. According to NATPOW published advertisement in the daily leading English Newspaper “The NEWS” Islamabad dated 17th March’ 2011 regarding “POSITION VACANT” “A not for profit organization established by the Government of Pakistan, to act as an interface between Government, Donors and Civil Society & Private Sector and play catalyst role to create effective partnership for interventions in various thematic areas of Safe Motherhood, RH&FP, invites Application to fill-up station specific positions as per advertisement” . Contrary to cited above advertisement on one side the Petitioner was terminated by former respondent no.2 while another side to spending huge money on newspapers advertisement to enter their own favor staff at NATPOW to hides their administrative & financial irregularities at NATPOW to promote nepotism and favoritism instead of good governance was against of democratic institutions and fundamental rights of the Petitioner as well. Supreme Court Tuesday issued orders for reinstatement of sacked employees of Hadeed Welfare Trust. Hadeed Welfare Trust is a subordinate department of Pakistan Steel Mills (PSM). Benefits accruing from legal position stated in such judgments would be given to those, who were not party before Supreme Court. [2010 SCMR 421. See also 2011 PLC (C.S.) 400 [F.S.T. ]; 2009 PLC (C.S.) 376 [S.C.]; 2009 SCMR 1 and 2009 PLC (C.S.) 374 [Lahore]. Relief having been granted to respondents by laying down criteria strictly in accordance with principle enshrined in Art. 25 of the Constitution which guarantees equal protection of law amongst persons which were equally placed, therefore, all persons who fall under that category to which respondents belonged, would also be entitled for the same benefits. Judgment of Court was thus judgment in rem. [PLJ 2004 SC 164. See also 1999 PLC (C.S.) 197 [S.C. (A J & K)] and 2003 PLC (C.S.) 1084 [S.C.]. Principle of equity, fairplay and justice required that since employees in earlier appeals were reinstated in service by Service Tribunal, the case of present employees being on the same footings should also be accepted. [2007 PLC (C.S.) 886 [S.C.]. Orders affecting large number of employees was challenged only by some of them before Service Tribunal. Contention of Authority was that grant of relief to present appellants would affect about 300 other employees of Corporation. Validity. Such contention was not sustainable as order proposed to be passed in such proceedings would be confined to cases of present appellants alone and not other employees having failed to approach Tribunal for redress of their grievance. Cases of those employees would be hit by doctrine of past and closed transaction. [2003 SCMR 1115 = 2003 PLC (C.S.) 368 [S.C.].